Among Camelot-crazed liberals, quoting President John F. Kennedy in support of a Republican tax-cut proposal is as much a sacrilege as quoting the Bible in defense of Bill Clinton's sexual behavior - in fact, judging from their acceptance of Rev. Jesse Jackson, much more so. So it is all the more understandable that Sen. Ted Kennedy (D-MA), the president's younger brother and the biggest political beneficiary of JFK's legacy, is pretty steamed about an ad running in support of President George W. Bush's tax-cut proposal. One conservative group is running an ad supporting the Bush tax cut, narrated by publisher and professional tax-cut enthusiast Steve Forbes, that quotes President Kennedy's 1962 address before the Economic Club of New York. This speech was the beginning of Kennedy's campaign for an across-the-board tax cut that eventually passed following his assassination and was signed into law by President Lyndon Johnson in 1964. Like Ronald Reagan before him, President Bush and his supporters are bolstering the case for a tax cut by touting the positive economic results of the Kennedy-Johnson tax cut. This ad however uses the martyred president's image and voice in the service of a cause his Democratic Party opposes. 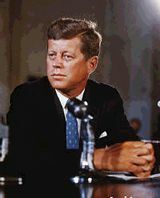 Sen. Kennedy and his niece Caroline Schlossberg, the 35th president's daughter, wrote the group a letter denouncing the ad and insisting that the use of JFK cease and desist. Syndicated columnist Charles Krauthammer quipped that their response was as if the Taliban had blown up the giant JFK bust in the Kennedy Center. They huffed and puffed about intellectual dishonesty and intone, "If President Kennedy were here today, he would vigorously oppose President Bush's irresponsible tax scheme." Family lineage notwithstanding, this assertion is no less unverifiable and ridiculous than the never-ending arguments about what Martin Luther King would support or oppose if he were still alive today. It's true. While Ted Kennedy voted for his brother's tax cut in 1964, he has a long public record of opposing tax relief from the original Kemp-Roth bill in 1978 to the tax cuts proposed by congressional Republicans in the last session. But that has no bearing on what his brother would support today or what he in fact did as president, anymore than President Reagan's policies were impacted by the childish ideology of Patti Davis. Keepers of the flame take note: While President Kennedy is an icon of modern American liberalism on a par with Franklin D. Roosevelt, he did not always take positions that would endear him with today's Ben and Jerry-munching left. He was a proponent of increased defense spending and an aggressive anti-communist stance during the Cold War. His friends in the Senate included Joe McCarthy, who he did not vote to censure, and Barry Goldwater. And he proposed what was at the time the biggest tax cut in history. Ted and Caroline argue in their letter that only 6 percent of President Kennedy's tax cut went to those earning $300,000 or more annually, that much-ballyhooed top 1 percent. President Bush's proposal is often said to give more than 40 percent of the tax cut to the top 1 percent, more than seven times as much. Even by the president's own estimates, the aggregate dollar amount going to the wealthiest taxpayers is much higher than what President Kennedy proposed. There are several reasons for this. First, the top 1 percent was paying 20 percent of income taxes collected in 1962 (under a 91 percent top marginal rate) compared to 35 percent today (under a 39.6 percent top marginal rate). Second, there are more people with incomes in excess of $300,000 today than with comparable incomes in today's dollars 40 years ago. Third, many low-income Americans have been dropped off the tax rolls entirely and no longer pay any income tax. President Kennedy's tax cut and the prosperity it generated helped along each and every one of those trends. Ultimately, what percentage of the tax cut the top 1 percent got is irrelevant and misleading. The tax cut that eventually became law in 1964 cut the top rate to 70 percent, or by 21 percentage points compared to the 6.6-point cut Bush is suggesting. The Kennedy tax cut equaled more than 2 percent of the economy, nearly double the 1.1 percent represented by Bush's proposal, and 12.6 percent of federal revenues - more than twice the 6 percent of revenues represented by the Bush tax cut. Kennedy wanted to let the highest income earners keep an additional 27 cents on the dollar rather than just six cents on the dollar as Bush proposed. Kennedy cut the bottom to tax rate to 14 percent while Bush would cut it down to 10 percent. It is perfectly valid for proponents of across-the-board tax relief today to cite the historical experience of such reductions in the past. President Kennedy's tax cuts touched off what was then the longest economic expansion in US history, with 5.1 percent annual growth rates from 1964 to 1967. Tax collections from the wealthiest taxpayers and federal revenues generally increased. All these trends were arrested by President Johnson's Vietnam-era income tax surcharge in 1968. In addition to the results and substance of the tax cut, it is perfectly responsible for Republicans to cite President Kennedy's views on taxation and tax cuts in principle. In the address the ad campaign cites, Kennedy calls for "an across-the-board, top-to-bottom cut in personal and corporate income taxes." He argued "that our present tax system ... exerts too heavy a drag on growth ... siphons out of the private economy too large a share of personal and business purchasing power, [and] reduces the financial incentives for personal effort, investment, and risk-taking." Kennedy explicitly endorsed rate reductions for high-income taxpayers in language that foreshadowed supply-side economics, proposing tax cuts "for those in the middle and upper brackets, who can thereby be encouraged to undertake additional efforts and ... invest more capital." Kennedy further argued in a January 24, 1963 message to Congress, "As I have repeatedly emphasized, our choice today is not between a tax cut and a balanced budget. Our choice is between chronic deficits resulting from chronic slack, on the one hand, and transitional deficits temporarily enlarged by tax revision designed to promote full employment and thus make possible an ultimately balanced budget." Lest members of Congress failed to get the point: "I repeat: our practical choice is not between a tax-cut deficit and budgetary surplus. It is between two kinds of deficits: a chronic deficit of inertia, as the unwanted result of inadequate revenues and a restricted economy; or a temporary deficit of transition, resulting from a tax cut designed to boost the economy, increase tax revenues, and achieve--and I believe this can be done--a budget surplus." It should be noted that many of Kennedy's more liberal economic advisors opposed the tax cut, most notably John Kenneth Galbraith. So did some Republicans who were fixated on green-eyeshade budgeting, such as a congressman from Kansas by the name of Robert Dole. Supply-side economics did not yet exist as economic theory and as Walter Heller has argued, the tax cut was at least part designed with Keynesian demand-side intentions. Nevertheless, JFK rejected arguments against marginal rate cuts that are identical to those being made by Ted today. That is something the ad campaign legitimately points out, to the chagrin of the senior senator from Massachusetts. The Kennedy family has tried to behave as if it has ownership of JFK's presidential legacy, from this dust-up over the tax cut ads to Patrick Kennedy's near fisticuffs with Bob Barr over a congressional speech that quoted the former president. For politically active Kennedys to accuse others of exploiting the legacy of Camelot is sheer hypocrisy. Not one of them, Ted included, would likely have gone as far in politics were it not for their relation to Jack Kennedy. Not everything Kennedy did as president can be used to justify his younger brother's political agenda. Just as Kennedy Treasury official Henry Fowler cited the Harding-Coolidge tax cuts of Andrew Mellon in support of their tax cut, the late Norman Ture was an architect of both the Kennedy and Reagan tax cuts - with the former being one of the experiences that began his pioneering work in supply-side theory. Much of the foreign-policy team with which Reagan won the Cold War was comprised of JFK-admiring Democrats (Max Kampelman, Richard Perle, Jeanne Kirkpatrick, Eugene Rostow, etc.). Are they too to be banned from using the words and image of President Kennedy? I hope that more Republicans point out the success of the Kennedy tax cuts in arguing for a new tax cut today, Kennedy clan carping be damned. Ted Kennedy may have made a career out of righteous indignation, but at times it gets a bit tiresome.